Vasanth Kumar Shivashankar Padukone, popularly known as Guru Dutt, was an Indian film director, producer and actor. Guru Dutt was born on 9th July 1925 in Bangalore, Karnataka. His father, Shivsankar Rao Padukone, was a headmaster and then worked in a bank, and his mother named Vasanthi was a school teacher, took private tuitions, translateed Bengali Novels into the Kannada and also wrote stories. Guru Dutt suffered from many difficulties from childhood, like economical problem, stressed relationship between mother and father, death of his brother etc. He had two brothers and one sister. His father moved to Bhawanipore, Culcutta where he completed his school. In Culcutta he learnt the Bengali language. Then he shifted to Mumbai, Bollywood. There he dropped his name Shivshankar Padukone and called himself Guru Dutt. His entry into the Bollywood universe in 1940. Initially Guru Dutt worked as a telephone operator. Then his uncle searched a job for him in Prabhat Film Company which was located in Poona. There he met to V.Shantaram, teh great film maker, who had by then launched his own Kala Mandir. At starting, he played small roles such as Krishna in Chand. For the film Lakharani he was assistant director and also acted in that film in the year 1945. He also appeared as a choreographer and assistant director in the film Hum Ek Hai which was released in the year 1946. After ending his contract in 1947, he lived with his family in Mumbai. There he started to write stories for magazines. In Mumbai he joined two directors Amiya Chakravarty and Gyan Mukherji. Then Dev Anand offered him a job as a director for his company named as Navketan. Guru Datt's first movie under Navketan was Baazi which was released in 1951. Guru Dutt got married with Geeta Roy in 1953. Geeta Roy was a famous playback singer. His family opposed to their marriage. They had three children, two sons and one daughter named: Arun, Tarun and daughter Nina. His marriage was unsuccessful. He was a deeply smoker and drinker. He also had an affair with Waheeda Rehamaan, another reason that led to the end of his marriage. When he was dead, he was alone. Geeta Roy died in 1972 because of heavy drinking and damaging liver. He performed in the movie "Chaudhavi Ka Chand" with the actress Waheeda Rehamaan which was released in 1960. In year 1962, he performed with again Waheeda Rehamaanthe in the film "Sahib Bibi Aur Ghulam". His last film was "Sanjh Aur Savera" released in 1964. On 10 October 1964, Guru Dutt was found dead in his bed in his rented apartment at Pedder Road in Mumbai. He is said to have been mixing alcohol and sleeping pills. His death may have been suicide, or just an accidental overdose. It would have been his third suicide attempt. 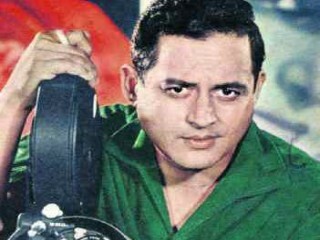 View the full website biography of Guru Dutt.